Sophia College, founded in 1941, is affiliated to the University of Mumbai. The Governing Body of the Society for the Higher Education of Women in India runs the College. The Religious Sisters of the Sacred Heart of Jesus and lay staff form the staff of the College. The Society of the Sacred Heart was founded in France in 1800, by St. Madeleine Sophie Barat. It is dedicated mainly to the all-round education of youth. There are now a number of schools and colleges of the Society all over the world, besides widespread innovative non-formal involvements. According to a long-standing tradition, the staff takes a personal interest in the harmonious growth of each student entrusted to their care. Sophia College is a Christian Minority Institution. Students of all denominations are welcome. The main goal of Sophia is the relentless search for Wisdom, through an education that is holistic and transformative. During the 1940s, the period of the Freedom Struggle and the early years of Independence, the College focussed on Home Science as well as on the Arts and the Humanities. Stress was also laid on inculcating pride in our national identity. (Urdhva Mula). In the 1950s, as post-independent India was making her entry into the technological world, education in Science was first introduced (initially up to the Inter Science level and from 1967 up to the B.Sc. level, later extended to the M.Sc. level in three subjects). In the 1960s a thrust was given to the social dimension of education. During the 1970s importance was given to vocational education. In the 1980s research was given a boost. Excellence and ‘Quality Assurance' were the in-words in the 1990s. In the first decade of the 21st Century our focus is on transformative education through networking and collaboration as well as through outreach work and extension of educational services to the community with special emphasis on the needs of women. The design of the crest draws upon Indian artistic traditions. On the outer edge is a row of pearls; inside, a lotus blossom design. In the centre is a tree, a very definitely Indian symbol. The outline of pearls in the crest is obviously significant, whether taken as a whole or singly. Taken singly, they are a beautiful symbol of wisdom whose light is from within, a quiet iridescent light that reveals its beauty in different ways, as the light from outside catches it at various angles. A crest surely typifies an ideal; as a group, the pearls typify the students, a number of units forming a whole, lovely in its united lustre and simplicity. The lotus frequently inspires the Indian poet, whose vision penetrates the inner beauty within the fair form of the flower. It is the symbol of purity, of good, which survives the test of bitter experience. The lotus flower, which has its roots in stagnant water and mud, presses up through the water towards the light and emerges poised in full bloom, above the refuse and muck beneath: an emblem of the individual soul, a seeker after divine wisdom, who conquers enveloping temptations and climbs towards the truth. The tree is a symbol of life and unity, of growth and expansion, of strength and shelter. In Indian literature we get a clear idea of the tree with its roots upwards as a symbol of life or creation. The tree with its roots upwards is very fitting for our crest because of its symbolism. The roots of our lives are anchored in God, for all that we are and all that we have is from Him. So the roots growing upwards will make us remember always that our source is God Himself, and all our efforts, our hopes, our ideas, to be of any worth, must be founded on God. The motto is “Urdhva Mula” – “Roots Upwards”. Two simple words, but eloquent all the same, they instil hope and courage in our hearts when we are weighted down by the burden of defeated hopes and unrealised ideals. Let us make of our motto an incentive, a stimulus, a flaming torch to light our minds with eternal wisdom. 2) The main building was named SOMERSET HOUSE after Sir Henry Somerset one of the Commanders-in-chief of the Bombay Presidency. 3) 1882 – The property was acquired by the Honorable Badruddin Tyabi. He built Somerset Annexe the nucleus of the present science building. 4) 1917 – Mr. Hormusji Nosherwanjee Vakeel bought the property and added the east-west wing. 5) 1923 – The house was occupied by the Maharaja of Indore. v 1937 – The Maharaja of Bhavnagar bought the house. 6) 1940 – The Society of the Sacred Heart bought the Somerset House, Somerset Annexe, some out-houses and the grounds. 1800 –The Society of the Sacred Heart is founded by Madeleine Sophie Barat. 1939 – His Grace Archbishop Roberts S. J. of Bombay invites the Sacred Heart nuns to start a women's college in Bombay. 1940 – The Home and Social Culture centre is formally declared open by His Grace Archbishop Roberts and the name SOPHIA COLLEGE is adopted; Mother Andersson is the first principal. 1941 – The ARTS FACULTY is started. The University of Bombay grants temporary affiliation to the college for First year and Intermediate classes. 1942 – Extension of affiliation is granted for Bachelor of Arts classes. 1945 – Sophia motto, crest and colours adopted. 1950 – The University of Bombay grants permanent affiliation to the college. 1952 – THE SCIENCE FACULTY is started with classes upto the Intermediate Science level. 1975 – Junior college is introduced. 1978 – The Post graduate Diploma Course in Clinical Analysis is started. 1993 – The Post graduate Diploma course in Quality Assurance in the Food and Pharmaceutical Industries is introduced. 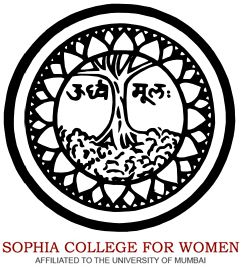 2001 – The Sophia Centre for Women's Studies and Development is inaugurated. 2003 – The Bachelor of MASS MEDIA Course is introduced. The Sophia College property possesses a long and interesting history. The campus area and the land in the vicinity belonged to the East India Company, and was later parcelled out into acres and sold. The bungalow which is now the main building was named Somerset House after Sir Henry Somerset, one of the Commanders-in Chief of the forces of the Bombay Presidency. In 1882, the property was acquired by the Honorable Badruddin Tyabji . The property changed several hands before it was acquired by the Society of the Sacred Heart in 1940, the Maharaja of Bhavanagar being the last occupant. Through the years that followed several additions have been made. 1941 - The shed was constructed. 1957 - A multi-purpose hall; replaced in 1977 by Sophia Bhabha Hall. 1964 - Library and rooms 9 -12. 1966-67 - The Science Building. 1975 - The Library Extension, inclusive of the A.V. Room, staff room, canteen extension and staff canteen. 1. All students are responsible to the Principal and to the Vice-Principals for their conduct in College. 2. Lecture hours will be announced on the notice board at the beginning of the academic year. Students should take particular care to be punctual. They are advised to attend all lectures regularly. 3. Students are required to carry with them daily their identity cards with their photographs fixed thereon. Identity cards without photograph, stamp and signature will not be valid. 4. Students applying for certificates, testimonials, etc. and those requiring the Principal's signature on any kind of document or application form should contact the Office In-Charge (see notice board outside College Office for further details). No papers should be taken by students directly to the Principal or Vice-Principals for signature. Sophiya College For Women, Mumbai offers various graduate courses as well as Post Graduate courses. Sophiya College For Women, Mumbai is affiliated to University of Mumbai, Mumbai. List of facilities available at Sophiya College For Women, Mumbai for students. This page was last modified on 6 October 2016 at 15:10.